Kelley Brothers Roofing, a professional commercial roofing contractor, has been one of the premier roofing contractors in the Southwest Ohio area since 1984. Our experienced management team and seasoned field staff have been consistently providing roofing solutions to building owners and general contractors for years. We have several divisions specifically trained for various roofing projects. Our service department has experience with fixing leaks and roof maintenance issues. While our other divisions tackle larger more complex projects. We have performed in both a Subcontractor and General Contractor capacity so we have the know-how to manage your project. We are fully insured and bonded with thousands of successful projects to post on our resume. There is no project too small or too large, no contract too simple or too complex. 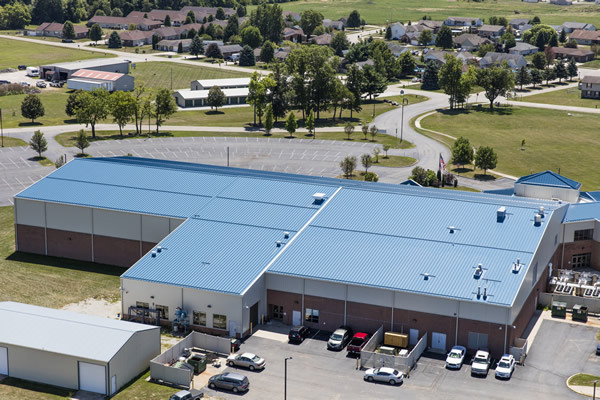 Whether you are looking for new construction, reroofing an existing facility, metal or rubber membrane roof projects, repair and maintenance, or simply a roof analysis, Kelley Brothers Roofing, Inc. is the roofing company to meet all of your commercial needs. Kelley Brothers Roofing is fully insured with a triple A rated carrier for our general liability. We exceed all typical insurance requirements that we are presented with from owners and General Contractors alike. Several projects such as government buildings require bonding. We have never had any issues on bonding a project and will be happy to do so if requested. Our surety company, Ohio Farmers Insurance Company, is an A.M. Best “A XIV” rated company and is willing to provide payment and performance bonds up to $10 million per project. In addition to our own insurance, we work frequently with Wrap Programs from different owners and contractors (CCIP and OCIP Programs). We are very familiar with the different nuances involved in wrap programs and we work very well with both our carrier and the primary insurance carrier for the project to ensure all required data regarding insurance and payroll is properly submitted. Experience installing roofs is of course very important, but executing the paperwork on the backend is equally important. Our administrative staff is extremely well trained and experienced. Besides the normal waivers and affidavits that most owners/contractors require, we also have extensive experience in electronic programs as well. Some of these programs include eMars. Textura (Oracle), LCP Tracker, Share Point and Oaks (State of Ohio) to name a few. We have the ability to create custom freeform invoices as well as custom G702 and G703 pay applications to match whatever specifications our customers require. We can send reports via paper, electronically send or upload onto owner/contractor specific platforms. In addition, we have also created custom Certified Payroll Reports and Employee Notification Forms based on our customer needs or requests. Our staff is 100% on top of all prevailing wage issues whether they are state related or through Davis Bacon. We work very closely with both our General Contractors and our 2nd tier subcontractors to ensure compliance on this issue. Kelley Brothers Roofing is fully committed to a diverse workforce and working with our corporate partners in regards to the same. KBR hires and promotes based on work performance. We do not discriminate based on race, color, creed, religion, gender, national origin, disability, age, sexual orientation, genetic information, military or veterans status. Kelley Brothers Roofing is an Equal Opportunity Employer. KBR has been certified compliant with the State of Ohio EEOD program as well as the State of Kentucky EEOD program. Many of our projects have a MBE, WBE, or Edge component included and we work very hard to meet or exceed those goals. KBR works with members of the community to make sure we are hiring suppliers and subcontractors that will help promote these diversity goals. Kelley Brothers Roofing has been working closely with two of our main suppliers for decades, Carlisle Syntec and Firestone Building Products. Over that time period, we have installed millions of square feet of roofing and received numerous awards. Carlisle has over 2,700 certified applicators in the United States and as of 2016, Kelley Brothers Roofing ranks as number 15th largest in the United States in terms of square footage installed with over 36 million square feet. In addition, for the past 14 years in a row, Carlisle has awarded Kelley Brothers the ESP Award which is given to their elite group of applicators throughout the US. Kelley Brothers has been the recipient of Firestone Building Products Master Contractors Award 18 times and the President’s Award several times. In addition, we have also been recognized by Firestone for their annual Metal Roofing award. Every year we strive to continue to be one of the best roofing contractors in the United States by improving our quality and commitment to our customers. Quality is our goal.